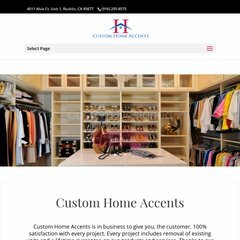 Topics: Why Choose Us, Rooms / Areas, Closets, Craft, Entertainment Centers, and Garage. 1 1 Internet Inc. Pennsylvania is the location of the Apache server. There are 2 Nameservers, ns52.1and1.com, and ns51.1and1.com. It is written for PHP/5.2.17 language. PING www. (74.208.244.155) 56(84) bytes of data. Pinging the server, resulted in a 0.815 ms response.